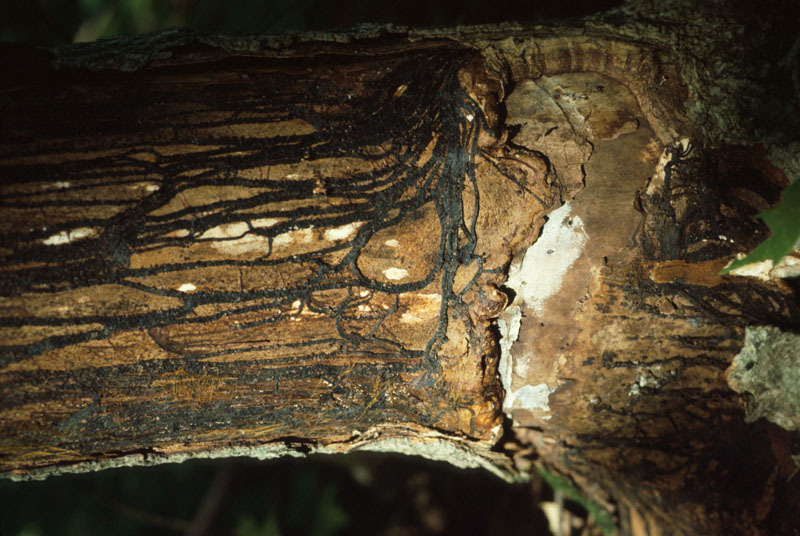 This is the most destructive and widespread disease involving pathogens that attack the roots and base of trees. In forest stands the disease will often kill trees either singly or in patches known as disease centers. These disease centers will continue to grow in size as the disease spreads outward over time. 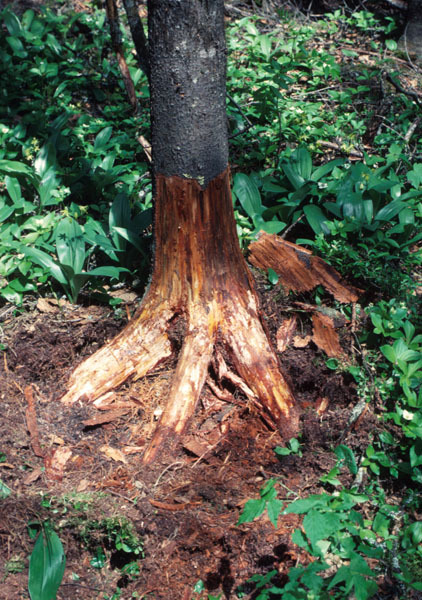 Trees with armillaria root disease might or might not show external symptoms. The first symptoms of the disease are a decline in tree vigour, foliage yellowing followed by gradual browning, and a considerable flow of resin in conifers. Needles on dying pine trees first turn yellow-green and then red before falling off. Spruce needles often become a dull green (but not red) before they fall off. The infection begins when the fungus, living in the ground, sends out filaments that invade healthy roots. It then moves to the root collar, and spreads to the tree trunk. 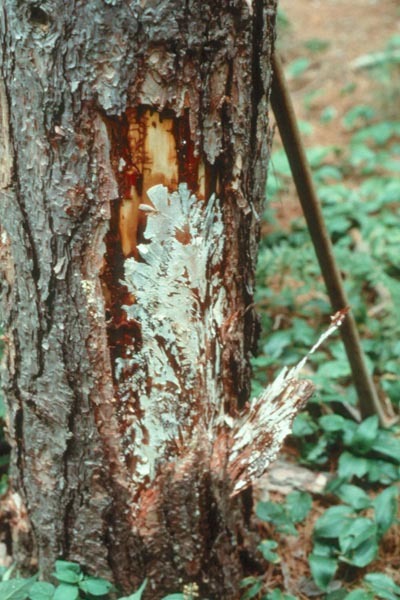 The spread of infection induces sapwood decay in the affected parts, and eventually kills the tree. 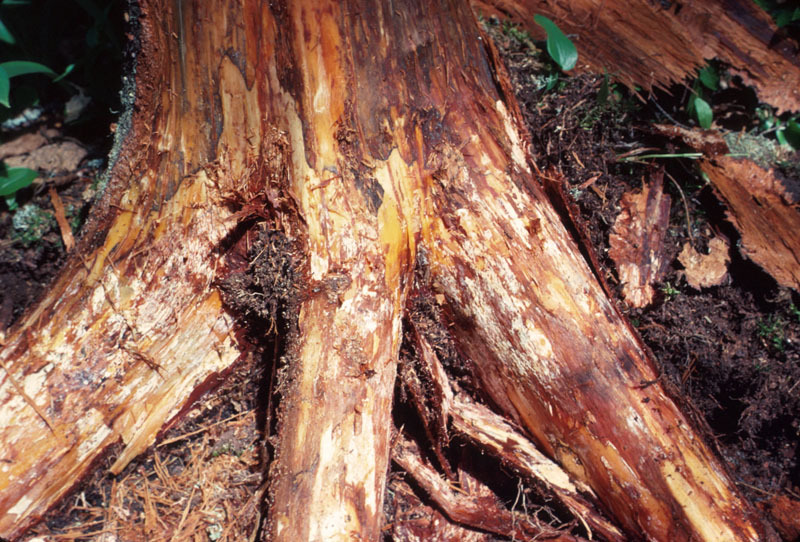 Trees with root decay die as a result of sap flow being cut off or following wind throw. The infected areas have cream-coloured plates along with black mycelial cords resembling shoe strings. 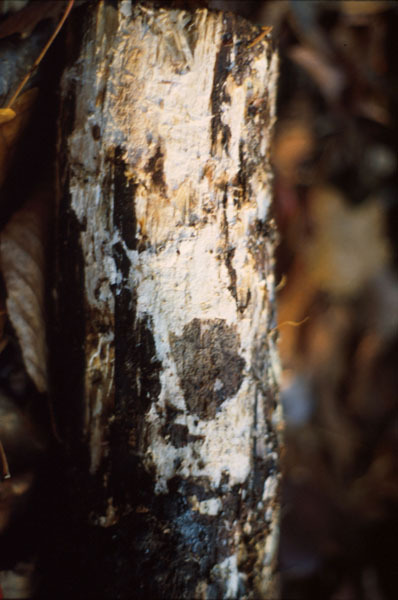 The rotting wood beneath the bark has a water-soaked appearance and is pale brown. Over time, the wood yellows, then whitens and becomes soft, spongy and stringy. 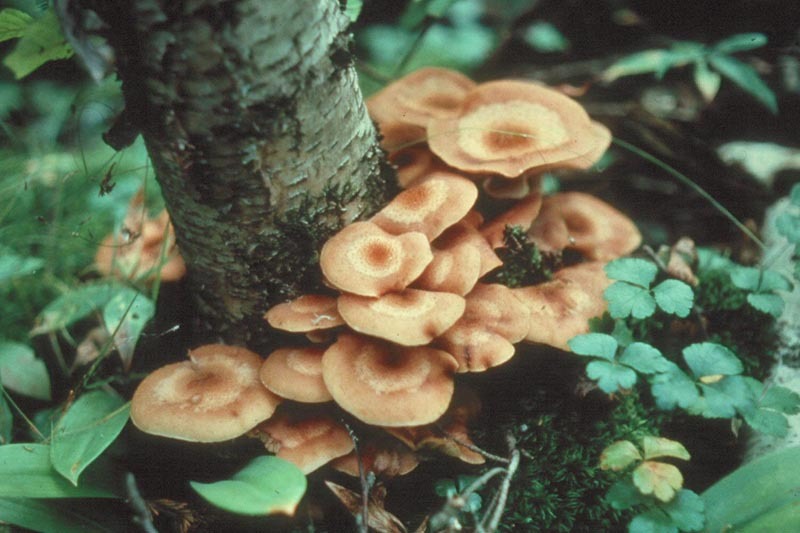 In the fall, golden yellow fruiting bodies can be seen near infected trees or at their base. The fruiting bodies have darkish scales on the cap and fairly close yellowish white gills. The long, fibrous stem is encircled by a thin membranous ring. The fruiting bodies produce spores that are dispersed by the wind and end up creating new pockets of infection. 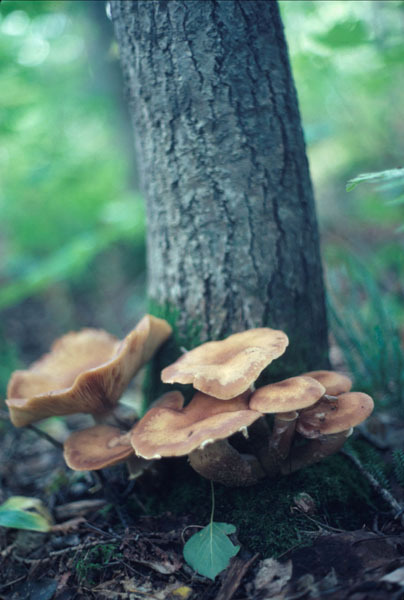 Armillaria root disease is caused by several closely related species of Armillaria. 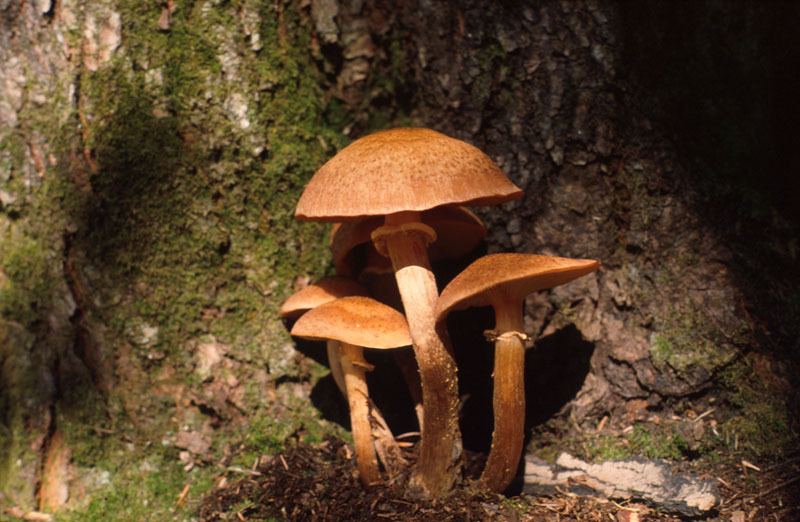 Armillaria ostoyae is the most prevalent and destructive of the Armillaria spp.. The causal fungus of Armillaria root rot can remain alive for many years in rotting wood on the ground. Some root disease centers have been estimated to be more than 400 years in age. 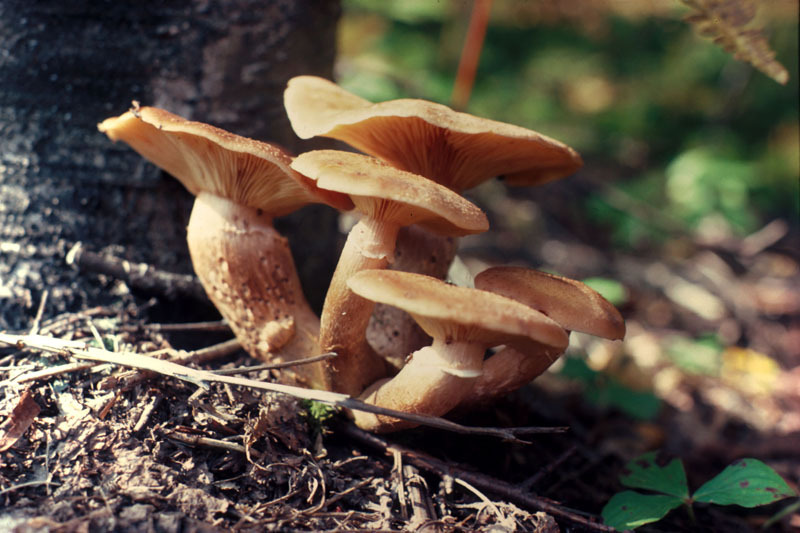 Although the fungus usually lives on dead organic matter, it can attack healthy trees and cause major damage. The fruiting body is edible but opinion is divided regarding its flavour. It is best to consume only young specimens. Be sure to carefully identify them first. Trees whose foliage appears healthy but have rotten roots can be hazardous in campgrounds, or around buildings because they are susceptible to wind-throw. Fruiting bodies of Armillaria spp., the causal agents of Armillaria root rot, at the base of an infected birch tree. Mycelial fan under the bark of a jack pine infected by Armillaria spp.